Are Orthotics a Good Choice for Children? If your child is howling with foot pain, is orthotics an appropriate and effective way to help them? We get this question a lot. At Dallas Podiatry Works, we help fit patients with custom orthotics every day using advanced technology. However, often these are made for adults, whose feet (with a few exceptions) usually change shape slowly. As a result, one pair of orthotics can last for years and years if well cared for. Children, obviously, have different needs and circumstances. So are orthotics really appropriate for them? In general, the answer depends on your child’s age, the condition they’re experiencing, and how severe their pain or symptoms are. Young children just learning to walk almost never require any kind of orthotic support, even if they have conditions such as flexible flatfoot or intoeing. First, those conditions tend to disappear on their own, and orthotics and bracing don’t have much, if any, effect anyway. Second, young children need to naturally build up stability and strength in their lower limbs. 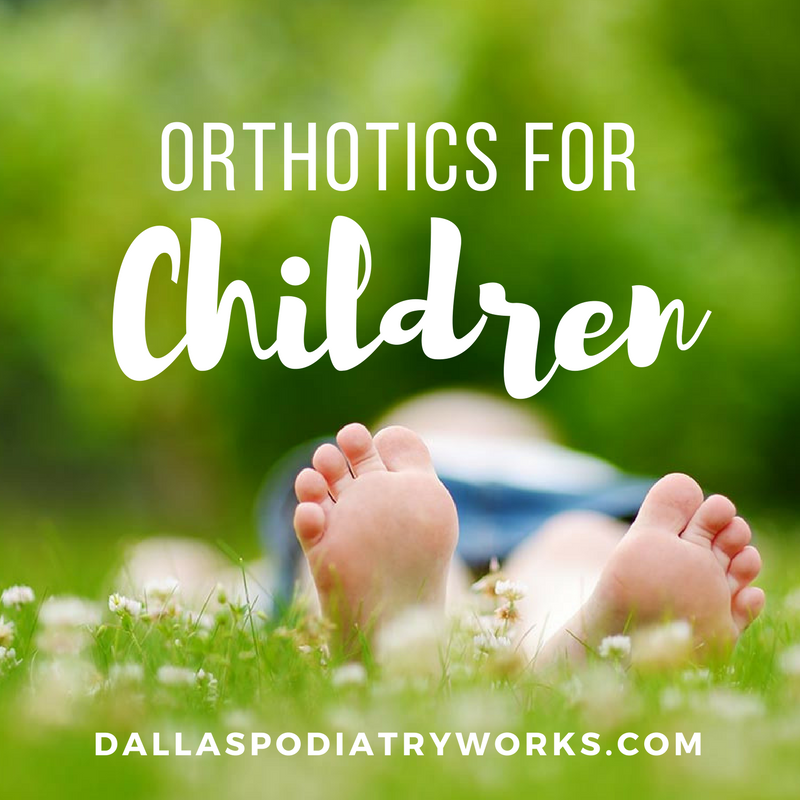 If your child is a little older, however, and experiencing acute or chronic pain in their feet, a pair of either custom orthotics or prefabricated insoles may be appropriate and can provide significant relief. Depending on how the child’s foot develops, orthotics may only be needed temporarily. Some conditions resolve naturally. However, sometimes long-term orthotics are necessary. Although children’s feet are still growing, by the age they would ordinarily be prescribed orthotics, they can usually get at least 18 months of use from them before they are outgrown. Parents are often, understandably, a little nervous about getting orthotics for their children, especially if the child is less than enthusiastic about wearing them. However, keeping your child’s feet in a correct, neutral position while they run, jump, play, and grow is extremely important. Without that, children experience pain, withdraw from healthy and active habits, and may develop gait issues that persist throughout adulthood. At Dallas Podiatry Works, we offer state-of-the-art resources and technology and advanced training in orthotics fitting for children and adults alike. If your child needs some kind of insole support, we will make sure they get the correct one. To schedule an appointment for you or your child, please give us a call today at 972.566.7474.